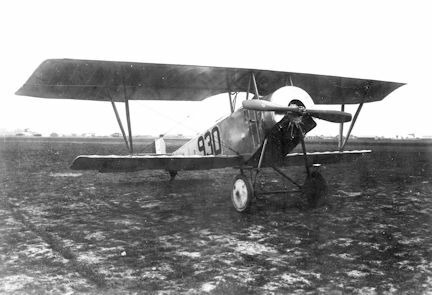 The Nieuport 12 is 2.6 MB. Larger files take longer to load. This is the Nieuport 12 listing page, here you can download the plan, article and see the main thumbnail and extra images. 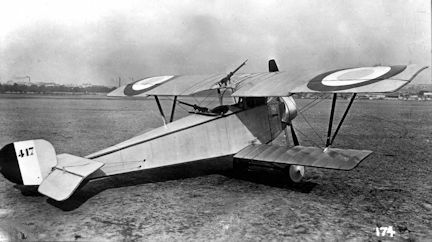 The Nieuport 12 was a French biplane reconnaissance, fighter aircraft and trainer used by France, Russia, Great Britain and the United States during World War I. Later production examples were built as trainers and served widely until the late 1920s. 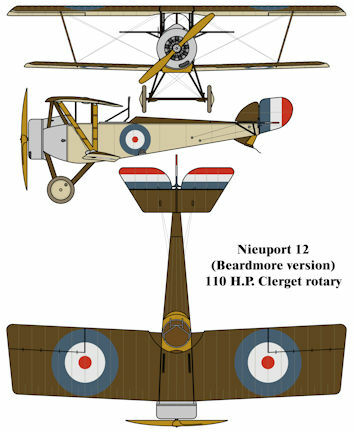 Model Airplane News Nieuport 12 plan was designed and drawn by Martin Irvine. The wingspan is 68 inches, a wing area of 1250 square inches, with a flying weight of 7.5 to 8.5 pounds and powered by a 400 to 500 watt belt driven electric motor. There is a note on the plan sheet commenting on the conversion from electric powered motor to gas powered engine. The plans show a wing rib template for the upper wing but none for the lower wing, making the construction of the biplane wing set a bit difficult. The vertical stabilizer and rudder as well as the horizontal stabilizer and elevator are constructed of 1/4 inch balsa sticks. The top wing is built flat the lower wing has 3/4 inch dihedral in each wing panel. These are the details for the "Nieuport 12" plan. If you would like to become a plan editor and help us to edit the attributes of all the plans in the website please click the "Edit Attributes" button below. Order your Nieuport 12 prints today! The Nieuport 12 plan can be printed on plain paper, tracing paper or polyester film and shipped worldwide. Scale: The original wingspan for this model is 68 in. / 172.7 cm. Please Change the values below to order in a different wingspan. This tool allows you to calculate the cost of printing and shipping the Nieuport 12 plans and its building article if available. If you need to resize a plan please contact us with the ID:82950 and the desired wingspan. I will calculate a price upon request, please contact me here mentioning this PlanID: 82950 and the job you wish me to do. This plan is 2.6 MB and was shared by our member kenb on 01/04/2015 12:09 in the PDF Bitmap Wood Model Airplane Plans (2) category. It has been downloaded 481 times.